Sixeyes: Marc Bolan Begat Devendra Banhart? Marc Bolan Begat Devendra Banhart? I have never spent much time delving into the glitter of Marc Bolan's T Rex. Of course there are several songs that made an impression over the years, but I have never even held a T Rex album in my mitts... ever. Now along comes (and don't ask me where I found this song as I can't for the life of me recall) a song by the late Marc Bolan (originally Mark Feld) called "Dreamy Lady" and all I can picture when enjoying it is Devendra Banhart's big (formally) hairy mug . 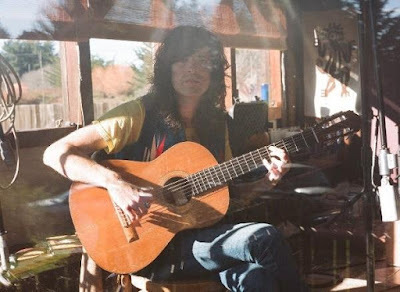 Mr Banhart must be a fan, or perhaps, and I think this highly likely, Banhart in his very early years (around 10 or 11, maybe) must have discovered Bolan's inspired take on hippie psychedelia and his unmistakeable vocal stylings and it left a permanent mark. So, here is Bolan doing the aforementioned song from his 1976 album called Futuristic Dragon and some Banhart for you to compare. It's uncanny, but Bolan could not possibly be Banhart's father, as he died four years prior to Banhart's birth in '81, although the now clean shaven Banhart (in the picture above) vaguely resembles Bolan. Just coincidence? I think so. *Banhart is currently working on a new album. You can see more pictures at his myspace page. Listen to the T-Rex record "Beard of Stars" ... Banhardt basically lifted his style from it.